Kate Beckinsale is back as vampire heroine Selene in the highly anticipated sequel to Underworld. Underworld Evolution continues the saga of war between the aristocratic Death Dealers and the barbaric Lycans (werewolves). The film traces the beginnings of the ancient feud between the two tribes as Selene (Kate Beckinsale), the vampire heroine, and her love Michael (Scott Speedman), the lycan hybrid, try to unlock the secrets of their bloodlines. The tale of action, intrigue and forbidden love takes them into the battle to end all wars as the immortals must finally face their retribution. 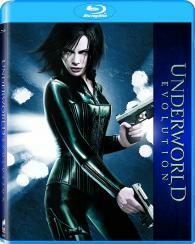 -BD Synopsis- Kate Beckinsale is back as vampire heroine Selene in the highly anticipated sequel to Underworld. As the war between the Death Dealers and the Lycans rages on, Selene (Beckinsale), the vampire warrior, and Michael (Speedman), the werewolf hybrid, work together in an effort to unlock the secrets of their respective bloodlines.